We had such a good time on San Juan Island. We will be back to visit again, hopefully soon. Sadly this was the second and final stop of my coffee “tour.” This deficiency in coffee tasting will add to the pile of motivation we already have to return to this wonderful place. Here’s my recommendation: If you’re want a larger cafe (compared to most urban cafes) that is friendly, has lots of energy, and has good beverages this is your place. If I have any writing or studying to do when I’m back in Friday Harbor The Bean Cafe is where I’ll land. If you want quiet, I would ask the staff when those times are or find a different shop. Also, an important factoid is that The Bean is across the street from the Ferry parking lot. Grab some Joe before you have to go. (Corniness intended.) Don’t be afraid to give The Bean a try when you’re on San Juan Island. Cheers. Thanks for stopping by. Be uncommon. Espresso and bacon, yes please. Excuse me my Veg and Vegan friends, I’m going to talk about meat. If you like bacon, listen up. If you like espresso, listen up. These two favorites meat in a seemingly wonderful combo. I’m also a very big fan of maple syrup. What’s not to like about this? Thanks ladies at Seattle Coffee Gear! Coffee Elite, I have a question. Who started the 12oz bag thing? This trend came to my attention about 2 or 3 years ago. I went to my local shop at the time [The Pheonix ] to grab a bag. When I picked it up I immediately noticed that it was lighter. I mentioned to phenomenon to the barista, and she told me that was the new size Intelligentsia was packaging in. I noticed that the price was somewhere within $1-$2 of the full pound price. A 1/4 less coffee for about the same price. I can think off 3 reasons. Of course I am not a bussinessman. I’m not a craftsmen of coffee, yet. But this is what I can come up with. 2. Profit Adjustment: Perhaps they hadn’t passed on rising costs to the customers. Perhaps it was overdue. I’m guessing not, this tends to happen more with mom-n-pop/local businesses not international ones. 3. Let’s make more money because we can. People will pay for it at that price, so let’s sell it to them. Even when times are tough, if you can afford great coffee you do it. They banked on that. 4. There was a OCEC [Organization of Coffee Exporting Companies][Tip: this is not a real organization at the time being.] meeting where they plotted a price hike across the coalition. We’d like to think that there isn’t some greedy room full of coffee guru’s, but this is ‘Merica the land of opportunity. Has this stopped me from buying coffee? No. The best coffee? Yes, at times. Today I’m drinking a great roast by Caffe Lardo, Diablo. I paid about the same for 12oz here in Seattle that I did for that Intelligentsia 2-3 years ago. So, 3 years of inflated costs, plus a 60% cost of living increase from 49085 to 98119. You can imagine my shagrin at the til when I left with 1/4 less coffee than I expected to that day. I really tried to find a Melitta pour over brewer in Berrien County before we left. Nope. Every box-store has French presses, and K-Cups in stock. So this is what I came up with. Had I thought about it earlier I would have brought my food-grade funnel to do the job, but its packed in a box right now on a westbound semi. All I used was a sink screen and K-Cup paper filters. I let the grounds bloom like a Chemex or other pour-over then you, well… pour. I heated the water with the coffee maker in the room, or the Bunn out in the lobby. The coffee it made was better than what we’ve had on the road so far. I know that I have arrived at coffee-snobdom for sure when I turn coffee down if I don’t like it. Today Was another good day. The boys stamina is winding a bit, but they’re behavior overall is still great. This morning I grabbed some espresso. I was a little worried when I walked in to the Hotel/Spa/espresso bar because the 2 young ladies there, one in pajama pants, looked like they were 16. Not that well trained 16-year-old’s can’t make good baristas, but we’re not in Seattle or Rome, we were in Hot Springs, SD. I was happy with the product. We made to Wind Cave with some time and spots to spare. I had been there when I was 16 with my Mom and a friend. It’s pretty much how I remembered it. It was fun to “explore” and learn about the cave with the boys. They were the kids that talked a lot, but they listened to the ranger’s instructions. Lot’s of pictures. On our way, just north of the cave we say another heard of Bison. We didn’t just see them, they wanted to cross the road. We ablliged. Hit the road. Along the way we the terrain changed, almost exactly with the state lines. When we hit Wyoming, there was much more sage and less rocky hills and Pondarosa Pines. It was high planes pastures and sage. When we hit Montana, it chaged again. It was less winding and sharp turns. The clouds were puffier and left deeper, more pornounced shadows. I love it out here. I know a lot of people get bored out here, but my mind is exploring and imagining what it would be like on a 4-wheeler or a horse. We found our hotel and grabbed some grub. The pool is a favorite stop. This pool was slightly warmer than Lake Michigan in June. Nevertheless after we turned blue we were fine. Jen had a pool toy surprise that provided tons of fun, especially for Graeme. It was underwater glider. If you adjusted the wings/fins it did different things. Another great day! Thanks for tagging along. We made it safe and sound to Rapid City, SD. This is not going to be in depth, just because I’m so tired. Hopefully this will bring a good recap to all my tweeting. Morning Highlight: Bean Juice Coffee. Jen found them in the LaCrosse WI visitors guide. They fill a travel mug for $1 if you mention the ad. We had some great Ethiopian. They roast on sight, so I was stoked to find them. The coffee was great, and so was the hospitality. I sipped on it all the way across Minnesota. Mid-day Highlight: Just into to South Dakota there was a rest area where we had lunch. Jen brought out a surprise toy the boys ran around and played with. There were people filming something while were eating. It was obviouse to me because they did about 5 takes of a drive up and walk to the building. A ways down the road we ran by the Corn Palace in Mitchell. We didn’t get out, we just snapped pictures. I didn’t really care about getting plastic tomahawks, polished rocks or candy, we needed to rack up some miles. Afternoon: We stopped for a pitt stop at Belvidere, SD. The gentlemen at the gas station had a dog named Buddy that was really friendly. Joel couldn’t leave without a good bye hug. Overall: The boys really did great. They helped each other more than usual and were polite most of the time. When we got to the hotel I got in each of their faces and told them how proud I was of them. Tomorrow is sight seeing. It’s a total of an hour and half drive tomorrow. More tweets to come. Thanks for joining us. So we’re off. It feels good to get a few hours on the road under our seat belts. Its a good warm up for tomorrow. By the close of business tomorrow we’ll be in the Black Hills. We’ve got a pool with a slide and a nice room. We had a lot of fun and my eye are blood shot, a sure sign of fun. In anticipation of bad coffee in the road I was in pursuit of a small one cup pour over brewer. No one in northern Berrien county had one. The box stores all have put their stock in K-Cups or French presses. So I bought pieces to patchwork something together. We’re good for the morning, there’s a coffee roaster here in LaCrosse [WI] that will fill your travel mug for $1. Awwww yEEEEahhhh! Look for the Foursquare check-in on that in the morning. Now we’re up in the room chilln’ to River Monsters. Tune in tomorrow for our next Episode. In case you’ve missed updates from me lately, this is for you. I’m writing this at Midway Airport in Chicago. We’re killing time before our flight to Seattle. Seattle! We’ll also be check out some schools, as well as eating great food and connecting with not-yet-known great people. I’ll keep the Twit fired up and the updates coming. Stay tuned dear reader, stay tuned. 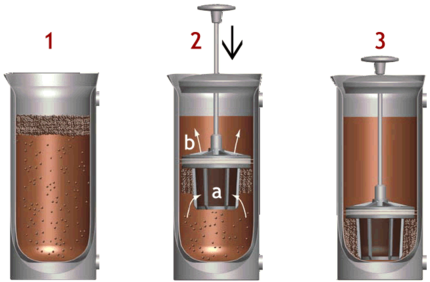 Thanks to Wired’s Gaget Lab I just came across this new French Press by Espro. It has an extra filter that will keep most of the goo out of you brew. To top it off the vessel is double-walled steal to keep the coffee hot for a while. If you’re looking to upgrade your French Press [ cafetiére ] give this a look. It’s not a Bodum from Target. Think of of it as a cross between a micro-filtered press and a carafe. Enjoy. I understand the lure of the open road. I’ve only gotten to eat a crumb from that table so far. Thanks to a generous friend who let me barrow his motorcycle, I got to run along the Lake Michigan Shoreline today. The two lane roads amble along the watery behemoth. The bike and I would just sway back and forth with the rythm of the road. I will have my own bike again someday. It’s been 14 since I had one. 14 years since two friends barrowed it and were hit by a car. I have grieved. Now I grieve and long for a two wheeled horse. The road to me is therapy. Ridding a bike to me is praying. There’s less between you and the road. Which is a deal breaker for most people. I’m open and vulnerable. Another deal breaker. There’s something special that happens in my soul when I ride. I don’t know what it is but right now, I feel at peace. Its as if I spent all day in silent contemplation. Perhaps I did. The only one I talked to was The Father. I feel as if I just returned from Mount Zion, or Sinai. I turned South. The time had come to head home. The boys would be out of school by the time I got there. Besides I had to be home to take Jen out for a belated birthday dinner. A solo road trip, and date night? Perfect. Until next time dear road. This makes for a good start. Picked up the "kits" yesterday. Look out U12 Boys Division!